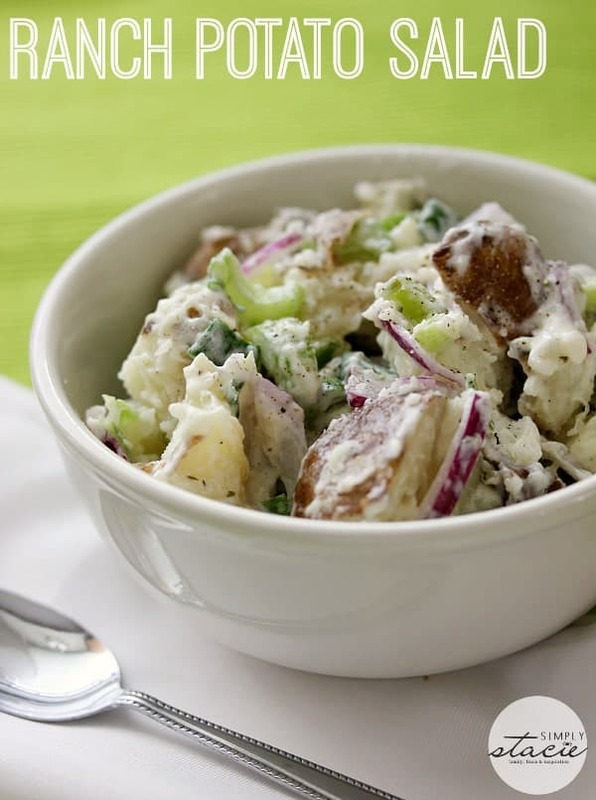 This potato salad recipe couldn’t be easier. The hardest part is boiling the potatoes! You don’t even have to peel them. 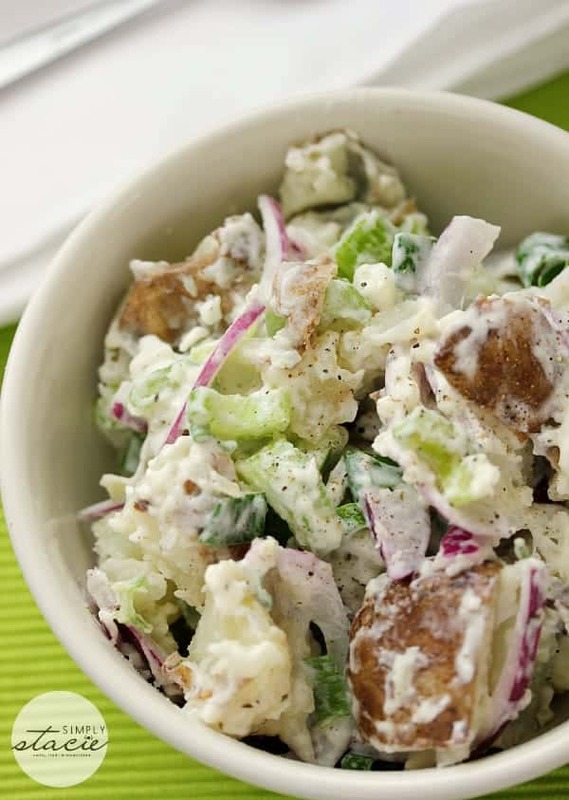 I love the flavour of ranch dressing and it pairs perfectly with the potatoes and crisp veggies. Use your favourite type of ranch dressing. If you use peppercorn ranch, I’d leave out the extra pepper so you don’t overwhelm your tastebuds! 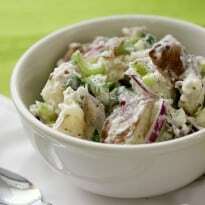 I typically serve potato salad at barbecues or potluck meals, but lately I’ve been making it as a side for our suppers. It goes nicely with steak or chicken. It tastes delicious served warm or chilled. The last time I made it I put it in the fridge to chill till supper time. I didn’t realize that one of the kids adjusted the temperature of the fridge to 0 degrees C. When I went to eat the salad with supper, the potatoes were like little ice cubes! Then I discovered why when I saw the temperature of the fridge. FYI it doesn’t taste good frozen! For more potato recipes, check out Dilly Sweet Potato Salad, Pizza Stuffed Mini Potatoes, Garlic Herb Grilled Potatoes and Roasted Potatoes with Poblano Peppers (Papas con Rajas). 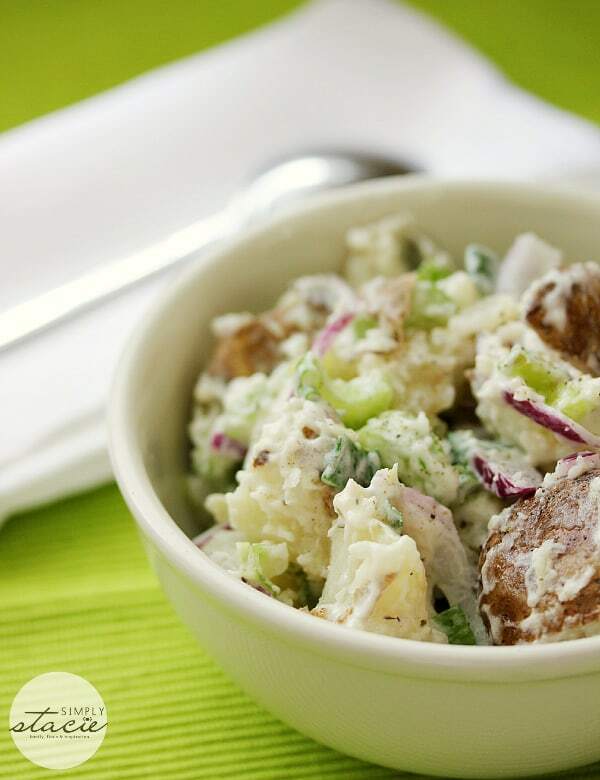 One of the yummiest potato salad recipes ever! Try Ranch dressing instead of mayo on your next batch. Add potatoes to a large pot on the stove. Cover with water and add the 1 tsp salt. Cover and bring to a boil over high heat. Reduce heat to a simmer and cook the potatoes for about 15 to 20 minutes, or until tender. Remove from heat and drain. Chop potatoes into large chunks and set aside. Combine red onion, green onion and celery in a large bowl. Add in potatoes and ranch dressing, salt and pepper. Stir to combine. Makes about 6 to 8 servings.